The ABC has upheld a complaint made by the ECAJ that the headline of an ABC online story about Gaza was ‘misleading’. The headline read “Israel attacks targets in Gaza following signing of Golan Heights proclamation”. 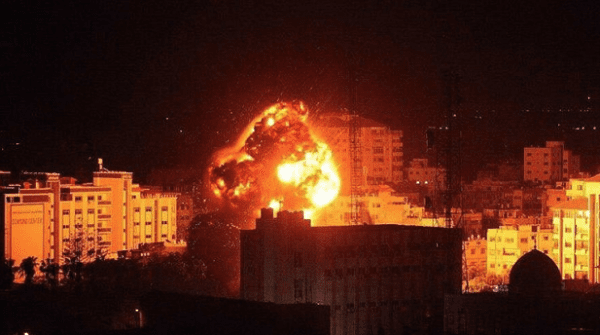 A view of an Israeli airstrike in the Gaza Strip on March 25, 2019. Credit: Twitter via IDF Spokesperson Unit. The ECAJ wrote in their claim: “This is a misleading headline for two reasons. Firstly the headline falsely implies that there was some kind of connection between the US “presidential proclamation recognising Israeli sovereignty over the Golan Heights” and the Israeli Air Force strikes in Gaza. There is no evidence to support that proposition. Secondly, the headline fails to reveal that the Israeli air strikes were a response to renewed rocket fire at Israel by armed Palestinian groups in Gaza, which caused injuries and destruction of property in central Israel the previous day. We understand that at least six people in Israel, including two babies, suffered burns and shrapnel injuries, and that one Israeli home was totally destroyed in the attack. In a tragic and oft-overlooked aspect of such acts of war, four pet dogs also died from the impact of the rocket. The firing of rockets intentionally at civilian populations is a war crime. Not only is it designed to terrorise and cause maximum loss of civilian life in Israel, the rockets are often deliberately fired by Palestinian terrorists from densely populated civilian areas in Gaza, to provide cover from Israeli return fire. This also is a war crime that endangers the very people Palestinian militants claim to be protecting and turns civilian infrastructure into legitimate military targets. The reply stated: “ABC News agrees that the headline erroneously linked two separate events, and it was corrected shortly after receiving your complaint to ‘Israel targets Gaza following rocket attack, Golan Heights proclamation signed”. Well done, ECAJ. The ABC goes into immediate default position with their headlines and summaries involving Israel, ignoring the true facts of situations to peddle their bias.